The Art Deco-style Lake Theatre opened its doors 75 years ago with the 1936 movie The Ghost Goes West as the featured attraction in the single 1,500-seat auditorium. But the real star was actually the modern new theater itself, with its instant landmark neon marquee that beckoned moviegoers from afar. The decorative scheme of the Lake Theatre is modern in every sense of the word, according to the publicity materials quoted in Oak Leaves. Starting with the simple dignity of the building front in white limestone and genuine black marble and bursting forth in the interior with clear, pure, vibrant colors, the entire structure exudes the spirit of sunshine, warmth and welcome. On April 11th, 1936 the well-known Oak Park landmark Lake Theater had its grand opening with a showing of “The Ghost Goes West,” starring Robert Donat. In a three page spread in the Oak Leaves, Lake Theater announces its grand opening and speaks of some of its main attractions. Among them is a circular lounge, the only in-theater lounge in the Midwest. Reached by two magnificent sweeping staircases, the lounge was known as “the Leather Room,” because its walls were entirely upholstered in, you guessed it, leather. The Oak Leaves also speaks quite highly of the Leather Room’s drinking fountain, which was designed in Italy by fountain artisans and hand crafted with only the finest Italian marble. The lounge that was located on the lowest level of Lake Theater has been since converted into a standing lounge, lacking the intricate upholstery, where you wait for your friends to get out of the bathroom, though the framed poster for “The Ghost Goes West” still hangs on the wall. Designed by the New York architecture firm Thomas W. Lamb, Inc., also responsible for the Empire State Building, the new theatre in Downtown Oak Park joined the Lamar Theatre and the Southern Theater under the same management as the place to catch the latest from Hollywood long before the days of DVDs. Today, the Lake Theatre is still Oak Park's newest movie theater and the Lamar and Southern theaters are long gone. 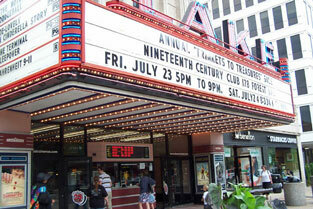 For more history and movie times, visit Lake Theatre.